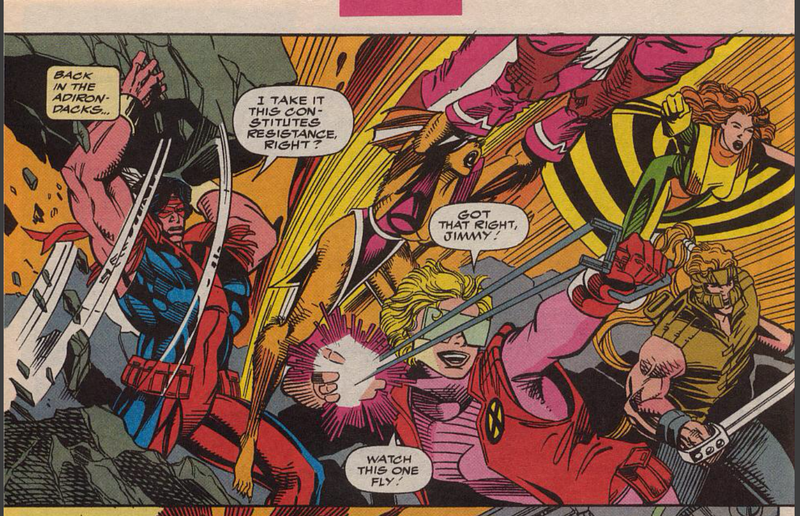 X-Force escapes SHIELD while Cable & Domino attack Tolliver. 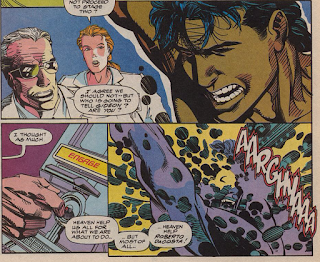 Having survived the destruction of X-Force's base, Cable teleports himself and Domino to Graymalkin. 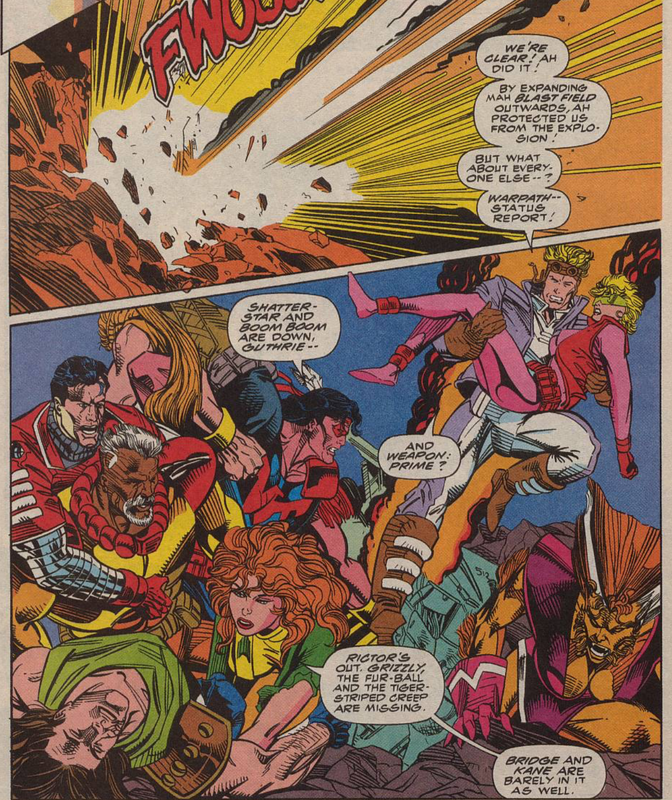 Meanwhile, X-Force & the remnants of Weapon: Prime emerge from the wreckage of the base, protected by Cannonball's blast field. Just then, SHIELD troops arrive to reinforce Weapon: Prime, but led by Cannonball, X-Force is able to overpower them and capture their IPAC vehicle for themselves. Putting in a call for medical help for the injured agents as well as Bridge & Kane, X-Force leaves, with Rictor joining them now that Cable is out of the picture. Elsewhere, Gideon's scientists decides to proceed with phase 2 of their experiments on Roberto. Aboard the IPAC, X-Force debates their next move, eventually deciding to hide out at Warpath's old reservation for the time being. 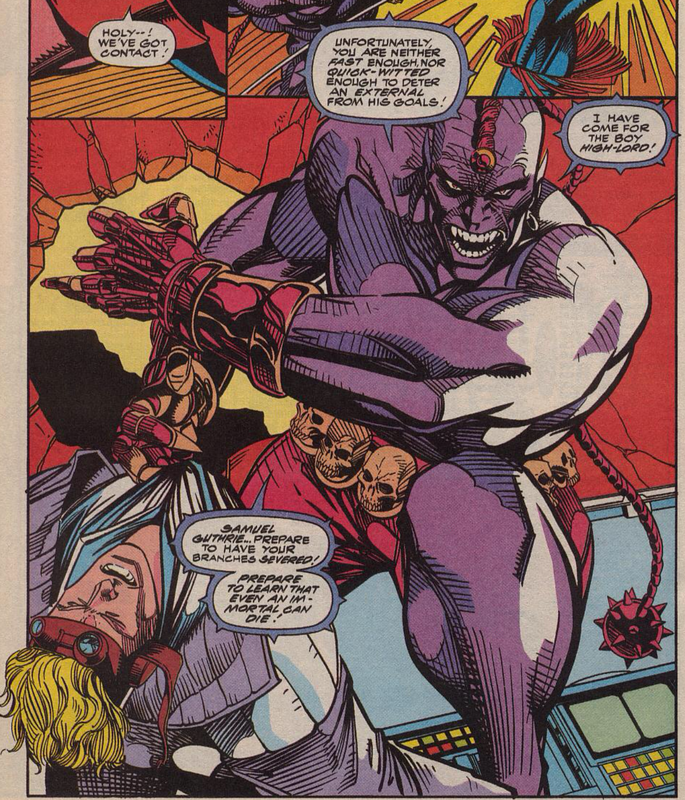 Just then, Crule attacks, determined to kill Cannonball. In Italy, Cable & Domino sneak into oneof Tolliver's bases, expecting to surprise him, but instead, they find Deadpool & Tolliver waiting for them, along with the real Domino, and Cable realizes the Domino with him is a fake. 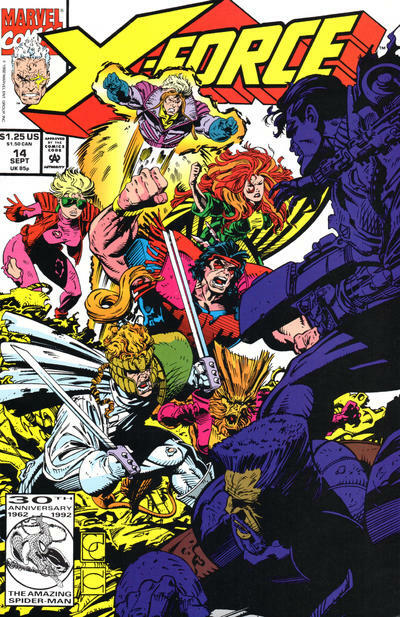 This issue marks the beginning of a protracted period of time in which the bulk of X-Force is separated from Cable and forced to fend for themselves, without his leadership/guidance. They'll briefly cross paths (albeit mostly from a distance) during "X-Cutioner's Song" but won't really interact with each other directly until "Fatal Attractions". With Cable out of the picture for the time being, Rictor joins X-Force this issue, leaving behind Weapon:Prime, saying his motivation was only ever about capturing Cable, and in the process, helping X-Force feel more and more like a proper "graduated New Mutants" book. 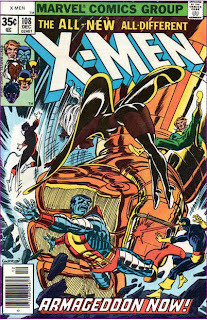 X-Force commandeers a SHIELD IPAC vehicle this issue; it will serve, in a constantly-diminishing capacity, as their chief mode of transportation for the next few issues. Cable comes face to face with the real Domino this issue, learning the one with him is an imposter (who believed the real deal to be dead). We inch every closer to the arrival of Greg Capullo (and artistic integrity for this series) with this issue, as Capullo provides the cover, and his arrival is announced for next issue. 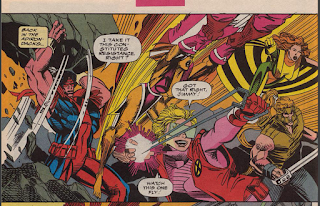 Terry Shoemaker, who was seemingly Louise Simonson's go-to fill-in artist during her New Mutants and X-Factor days, fills in on art in the meantime. 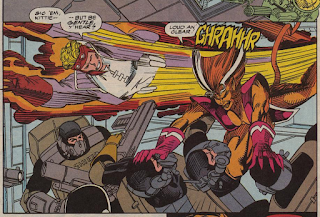 Cannonball is able to extend his blast field over all of X-Force & Weapon: Prime, protecting them from the explosion. It's also said that Yeti/Wendigo, Grizzly & Tygerstryke fled between issues. 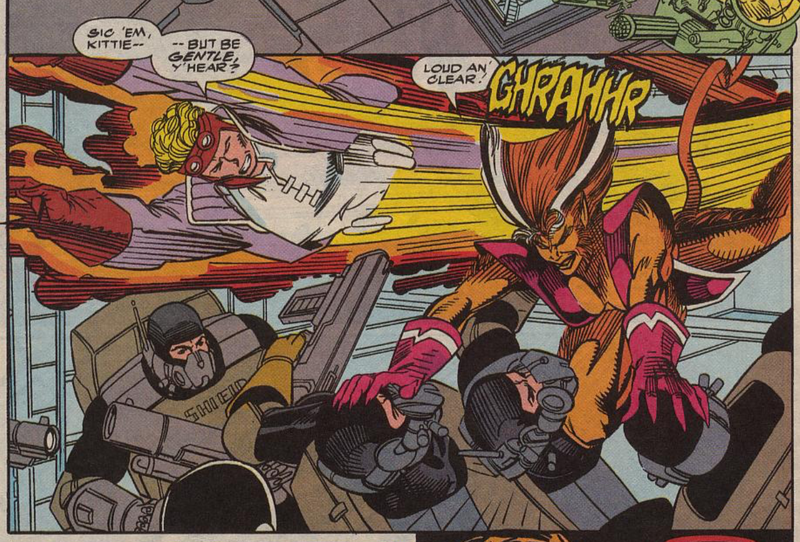 Once upon a time Boom-Boom mentioned having new wrist launchers to use with her timebombs, but Liefeld's art never really made clear what they were. Here, Shoemaker has her using basically a slingshot. Sunspot continues to be experimented on/tortured by Gideon's scientists. 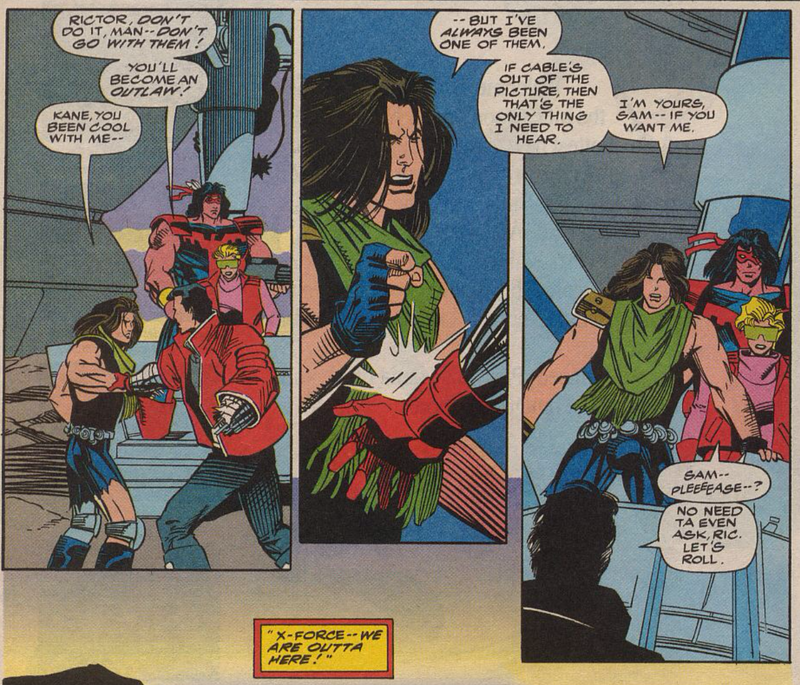 In discussing possible hiding spots for X-Force now that their base is destroyed, a heavily-damaged Muir Island is mentioned, but the group eventually decides on Warpath's old reservation. 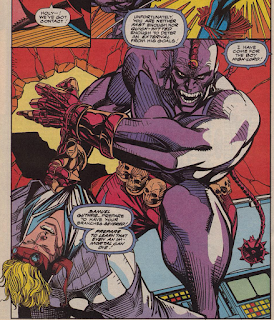 Crule attacks X-Force at the end of the issue, spotting an opportunity to take out Cannonball with Cable out of the picture. Crule was originally tasked by Gideon with eliminating Cable; it's unclear if his actions here are a contradiction to that, or just him adapting to the changed situation. Cannonball deposits Feral onto the SHIELD IPAC unit, but cautions her to be gentle. Cable, however, has no compunction killing Tolliver's associate Pico more or less on sight. Several letters are run this issue praising Mark Pacella's art and crowning him a worthy successor to Liefeld; these are clearly crazy people, or fake letters created by Marvel. The upcoming Deadpool limited series is also mentioned. There's a palpable sense throughout this issue of plot threads coming together, of stuff actually happening. 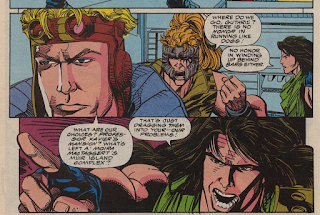 X-Force is cutoff of from Cable and on their own, they've fought off Weapon: Prime, Rictor has rejoined, and Crule is poised to attack. 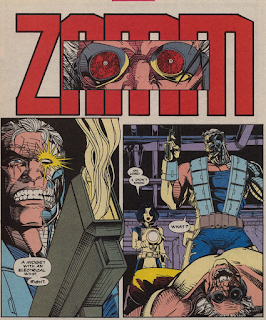 Meanwhile, Cable takes the fight to Tolliver, and finally learns that he hasn't been hanging out with the real Domino (and thus that the real Domino hasn't betrayed him). After so many issues that felt like a lot stalling (and plot-stalling issue-long fight sequences), it's refreshing just to feel some forward momentum for a change. Plus, the question hanging over all this - what is X-Force without Cable and what do they do - is a compelling one. It can't serve the series longterm, but for now, it's vastly more captivating than the more vague and generic notion of "we're the X-Men to the EXTREME" that had been guiding the series previously. Combine all that with Terry Shoemaker's art - which I've never loved but is competent & straightforward, especially relative to recent art in this book - and this issue is one of the young series' best yet. Tomorrow, X-Factor battles the Brotherhood in X-Factor #82. Next week, X-Men #12 and Excalibur #54. I’m still fuzzy on this magical “blast field” thing. How does the field exist to protect them in place without generating propulsive force? I guess Sam, like, keeps his mental brakes on and then halts ignition before actually taking off, but conjuring up such an equivalency to actual mechanical propulsion begs the question of what is physically in the air surrounding them. Possible ’90s reference: Given the all-caps lettering, Boom-Boom could be referring to Rictor’s “skid-row haircut” in the generic sense of the term or to his “Skid Row haircut”. I don’t care much about what’s going on but can’t deny that it’s nice to have stuff actually happening — and with art that tells not just a story but the same story being told by the words. I'm also really unclear on this. Is Cannonball invulnerable when he's blasting? If so, I really wish that would have mentioned it before.